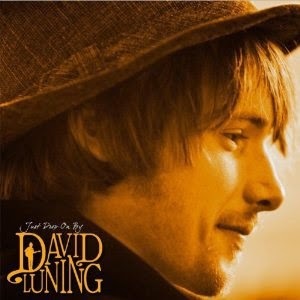 I just had the opportunity to listen to the newest release, Just Drop On By, by David Luning Band and its quite enjoyable. As my regular readers know, I saw Luning in concert with one of my personal favorites, Jimbo Mathus, last week and they impressed me. This release opens with title track, Just Drop On By, a very well written country influenced track with a great melody. Buddies Till The End is up next with a real warm recognizable feel. "Fit's like a glove" music with clever lyrics and strong melody and a taste of country gives this song particular appeal. Guitarist Dave Sampson adds some really nice steel guitar like guitar riffs giving the track a real party feel... "right off the juke box". Excellent! You And Me And The Devil In Between is a poppy ballad with a light country twist. Sampson plays lap steel on this number with mostly atmospheric effects. Brodie Jenkins adds some nice vocal harmonies on this track as well. The most memorable track on the release, Whiskey Bottle, is a track that not only has clever lyrics but one of those melodies that sticks with you for days. A hand clapping foot stomper, this track is hard to beat with all of the right components. I mentioned in my review of this band in concert, I really like Luning's voice and Sampson is really a strong proponent on steel guitar. A Little Bit Bad is a straight up ballad with only quiet, stylized harmonics behind the vocals. Fortunately, Luning's writing is solid, his acoustic work is good and his vocals are nice. Northern California is a really strong ballad utilizing only vocal, acoustic guitar, cello and cymbals. Very nice. Bed Of Roses is another of my personal favorites on the release. Luning has a certain manner of vocal delivery that is soothing yet not sleepy. It has country flavor but is not country and certainly not pop country (hooray). Josh Venne adds some stylized steel work on this track and Luning adds light harp work. Linden Reed on drums and Ben Dubin keep the bottom tight with Luning's acoustic guitar and Sampson steps up with clean electric guitar solos but playing it straight. Very nice. Ode To The Poorest Man On Earth is a humble ballad and again Luning on vocal, guitar and piano accompanied only by George Chavez on cello. Always Gonna Be That Way has a real pure quality with Luning on vocal, guitar and harmonica accompanied only by Zack Summer on upright bass. Waiting Room maintains a light touch but with very silky arrangements. Luning on vocal, acoustic guitar and piano is joined by Sampson on electric guitar,Dubin on bass, Reed on drums and Venne on steel. My Baby Blues On Wheels is a zippy acoustic driven track with Sampson on mandolin, Dubin on bass and Reed on drums. Stripped down this is happy go lucky party music. Sampson lays out a nice mando solo on this track giving it a bit of a bluegrass feel. The release is wrapped by Humble Apologizin', a track with a bit of Dylan, a bit of Waits and a lot of Luning. Playing a nice harmonica part on this last track give it a particularly smooth texture. This guy has his own sound and I really like it. The overall quality of the basic tracks, nicely balanced and delivered make this a sound that should be heard. When you want some solid ballads, feel good music and quiet solid guitar work...this may be your go to cd!